Planned Parenthood has long been a foe of pro-life supporters. While it claims to approach each situation without bias and have women’s best interest at heart, the real purpose of this taxpayer-funded, nonprofit organization is to make abortion easy and common. It tells young girls their decision to abort their baby is “sensible” and “acceptable.” In summer 2015, however, shocking videos incriminating Planned Parenthood staff with selling fetal tissue from abortions went viral—increasingly shattering their already fragile credibility. The scandal started a string of investigations, but under Obama’s helm, little effort was made to determine whether or not the nonprofit, which donates heavily to Democrats, should face criminal charges. In fact, more effort was made to investigate the Center for Medical Progress, the pro-life organization that exposed the disturbing undercover videos, rather than the actual purveyors of human baby parts. But with a new, Republican administration making changes in Washington, the tide could be turning for Planned Parenthood. Last December, Senator Chuck Grassley(R) sent a report to Obama's Attorney General Loretta Lynch and then FBI Director James Comey. In the report, Grassley declares that the committee found “substantial evidence” pointing to the fact that Planned Parenthood violated the law that bans the buying or selling of human fetal tissue and he calls for their investigation and possible prosecution. And this month, after an Orange County, California seller of these aborted baby body parts, DaVinci Biosciences/DV Biologics, settled for millions and closed its doors, we have good reason to believe Planned Parenthood is closer to being named in a lawsuit of its own. Whether this investigation proves fruitful, we are grateful the current administration is continuing its thorough examination and uncovering of the unethical and possibly illegal practices of Planned Parenthood. And yet, there are still so many battles to be fought and won in the courts, for our religious liberty. We are grateful for your prayers of support! And when you think about your year-end charitable giving, please consider a tax-deductible contribution to our important ministry. Without you, we would not be able to continue to work on pro bono cases that uphold our Christian beliefs, confident in the truth of God’s gospel and the supremacy of His ways. David Daleidin’s 2015 undercover videos showing high-level representatives of Planned Parenthood haggling over the purchase of aborted baby body parts shocked our nation. Even supporters of Planned Parenthood couldn't help but be appalled. Due to public outcry, a lengthy congressional investigation was launched in which it was discovered that a company in Yorba Linda, California, DaVinci Biosciences and its sister company, DV Biologics, were purchasing baby body parts from Planned Parenthood. It is a violation of both state and federal law to profit from the sale and distribution of fetal tissue. It was also discovered that this aborted baby parts supplier was located right next door to a place of worship! This prompted a year-long prayer vigil by Catholics and Evangelicals at the Church of Grace, as pastors and individuals united in prayer over DV Biologics and the surrounding community. In October 2016, Orange County District Attorney, Tony Rackaukus, filed suit against DaVinci Biosciences and DV Biologics. The company founders and principals, Estefano Isaias Sr., Estefano Isaias Jr., and Andres Isaias, were also named in the suit. To add to the depravity surrounding this case, further investigation revealed that the Isaias' were given the approval to immigrate to the United States after they donated to the Clinton Foundation while Hillary Clinton was Secretary of State. The case was set for trial in February 2018, but given the predicted outcome, was just settled this month. Da Vinci Biosciences and DV Biologics have agreed to forfeit their profits of over $7 million dollars and are required to cease doing business within 60-120 days. The settlement also requires them to pay $195,000 to the County of Orange and to donate any remaining fetal tissue as well as their research and medical instruments to a medical school. The medical school has not yet been named. This case is a striking reminder of the awesome power of prayer! And, as we continue our ministry of protecting life and religious liberties in the courts, Advocates for Faith & Freedom is so very grateful for yours! We won again!And I have a riveting story that underlies this significant case that thwarted the abortion industry. I hope you will read through this inspiring newsletter. 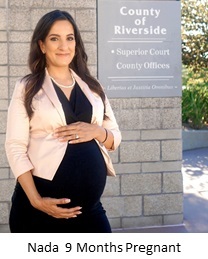 First, the Riverside Superior Court judge ordered the State Attorney General to CEASE the enforcement of the California’s Reproductive FACT Act in the case we filed for The Scharpen Foundation. The Scharpen Foundation operates Go Mobile for Life, a licensed mobile medical pregnancy clinic in California. The transportable clinic parks in public places offering women free ultrasounds, resources, pregnancy counseling and post-abortion counseling. The Reproductive FACT Act challenges our client’s mission to provide life-affirming options to women facing unplanned pregnancies. The state law requires nonprofit pregnancy care clinics to advertise for abortions by giving women a county phone number where they can call and get a referral for a free or low-cost abortion. The judge agreed that this law violates our client’s right to free speech under the California and U.S. Constitutions! Let’s now rewind to 2015 when I presented this case to our staff of attorneys. Nada Higuera, a first generation Palestinian-American volunteered to work on this case—the epitome of a David versus Goliath battle. 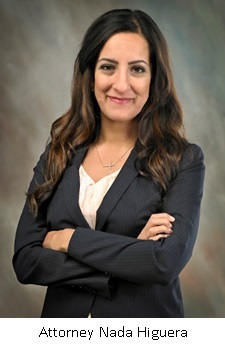 Raised in Islam, Nada became a Christian and now serves as an attorney in our firm defending religious liberties and promoting Christian causes. However, this case was particularly important to Nada. Nada had an abortion as a teen. When she was just six or seven years old, Nada was sexually assaulted by a family friend—a man in his fifties. The abuse continued for years, and Nada—too afraid to tell her parents and too young to understand what was happening—remained silent. Her abuser told her to keep quiet, and she remained in fearful silence. At 16 years old, Nada found herself pregnant by her abuser after she had purchased a pregnancy test at the grocery store. She knew she could not keep the pregnancy a secret. Nada told her sister, who relayed the information to her parents. Without a second thought, the family agreed that Nada would get an abortion. Her dad and sister drove her to an abortion facility in Modesto, California. After the abortion, Nada said she felt relieved because the abuse was over. She continued with her life, went to college, and then pursued her career. It was not until she came into a personal relationship with Jesus Christ in her early twenties that she realized the gravity of what had occurred. Nada said at first, she experienced deep guilt and sorrow, but as her newfound faith grew, so did her understanding of God’s grace and forgiveness. “It was only when I became a Christian that I started understanding the impact of what I had done,” Nada said. “I had taken a human life, and it was a baby made in the image of God. I knew once I became a Christian, that I was forgiven for that.” But her emotional pain did not just go away. Little did any of us know the impact this case would have on us as a staff, our clients, and especially, Nada. But God knew and orchestrated this entire case—every last detail— for His glory! Nada argued our case as she was nearly nine months pregnant! And Nada came off maternity-leave to argue the case at trial before the court. On September 9, 2017, she and her husband welcomed their daughter into the world. The case will now be appealed by the Attorney General in the state appeals court. Meanwhile, our sister case in federal court is being briefed for the U.S. Supreme Court where we will be filing an amicus brief advising the High Court of our state court victory. It should certainly have a significant impact on the success in that case before the U.S. Supreme Court. We can’t fight the state without your financial help! We have a lot of work yet to accomplish and every gift—large or small—helps us in our battle to preserve life, speech and our God-given freedoms. Please support Nada and our work with a financial gift as God may lead you. One California Pastor Is Finding His Voice! Not until the Church United Awakening tour in Washington DC, did two neighboring pastors - Bob Branch of The Springs Community Church in Temecula and Scott Scharpen of The Scharpen Foundation in Wildomar - even know each other existed. Then, by God’s providence, they were selected to be roommates and a lasting and meaningful friendship began. Inspired by the events of the trip, Pastor Bob was determined to get out of his comfort zone and speak up about the “uncomfortable” topics in our culture, one of them being abortion. With his new friend’s ministry in mind, he invited Pastor Scott to speak at his church about The Scharpen Foundation’s mobile pro-life clinic, “Go Mobile for Life.” They parked the mobile clinic in The Springs church parking lot and invited the congregation to tour the facilities. What an impact it had on all who experienced this life affirming ministry, especially Pastor Bob! We were so inspired by his message that we asked him if we could share it with you. Here is an excerpt: Also, notice Nehemiah’s tone and demeanor. He is gracious, humble and respectful. He prays silently the whole time. He’s looking for openness, for God’s answer, God’s movement. He’s driven by care, not by anger. Notice that he was scared to death! Finding our voice may mean facing some of our biggest fears. It doesn’t mean we gallivant into danger without a care in the world. It means that in the midst of the injustice, in the middle of the opposition, we are able, with God’s gracious strength and boldness to go for the ask. To speak into the situation. To give voice to God’s heart, God’s truth, God’s ways. Nehemiah found his voice with God, and shortly afterward, found his voice in the public sphere. God placed him there on purpose. He was to voice God’s heart and purpose to a pagan king, and when he went for the ask, the king accepted! Incredible! These matter, a lot! As we pray, God will begin to give us a voice to speak into areas that need change. To spe ak for him. As with Nehemiah, forging this new ground for something bigger than ourselves is difficult. But, this is how God has chosen to get his purpose advanced: through people like you and me, who at one point did not have a voice, and then, did! Nehemiah cared, prayed, went for the ask, and followed through. He went back to Jerusalem, rebuilt the walls, united his people, and worked as God’s change agent. Read Entire Sermon and Listen to Pastor Bob’s Sermon. As Advocates for Faith & Freedom continues to use our voice to fight for Religious liberties in court cases, such as The Scharpen Foundation free speech case, we encourage you to find your own voice! Whether you speak or sing; write or draw; volunteer or donate – we should all find a way to share the gospel and our biblical values. We can make a difference in our culture! We thank you for your faithful prayers and your tax-deductible donations!